Note:- Check Part 1 for Problems , Causes, Manifestations and Weaknesses , this part deals with the dissatisfaction , reforms and solutions. ‘Public order’ and ‘Police’ figure as Entry 1 and 2 respectively, in List II (State List) in the Seventh Schedule of our Constitution, thereby making State Governments primarily responsible for maintaining public order.Invariably, police, which is a part of the civil administration, is at the forefront in maintaining law and order. If a window in a building is broken and left unrepaired , people walking by will conclude that no one cares and that no one is in charge . One unrepaired window is an invitation to break more windows and lawlessness spreads outward from buildings to streets to entire community.Similarly when one witnesses when justice is delayed or inaction of police , one looses faith in them and i.e. exactly one of the undercurrent running in Indian society. Public cynicism is the testament to this fact. Article 355 of the Constitution enjoins upon the Union to protect every state against external aggression and internal disturbance and thereby to ensure that the government of every state is carried on in accordance with the provisions of the Constitution. The Police Act, 1861 is still the basic instrument governing the functioning of the Indian police. The police are the instrument of physical force of the State. They have to bear the burden of failure of other instruments of governance as well. Thus the police always has to be at the forefront and face the wrath of the public even for the failure of other instruments of governance. The police have faced and continue to face many difficult problems. In a country of India’s size and diversity, maintaining public order at all times is indeed a daunting task. It is to the credit of the police that despite many problems, they have by and large been successful in maintaining public order. Despite this, the police are generally perceived to be tardy, inefficient, high-handed and often unresponsive or insensitive. In the perception of the people, the egregious features of the police are politically oriented partisan performance of duties, partiality, corruption and inefficiency, degrees of which vary from place to place and person to person. The problems faced by police force is not only fault of the police fore with in , it amalgamation of social discontent arising out of multiple institutions of government. Lack of coordination between various government agencies. Nearly 87% of all police personnel are constables .The constable is the lowest level at which recruitment takes place. The educational requirement for selection of a constable is a school leaving certificate. A constable can generally expect only one promotion in a life time and normally retires as a head constable. Judge-population ratio is of the order of 11 to 1 million, whereas in many developed democracies it is of the order of 100 to 1 million, or nearly ten times that of the strength of the Indian judiciary. The pendency of over 25 million cases is a testimony to this.It is therefore not surprising that people, particularly the poor and vulnerable, have little faith in the system’s capacity to deliver justice or enforce their rights. One of the major problems impeding police reforms stems from the traditional approach of clubbing a variety of disparate functions in a single police force and concentrating all authority at one level. A single, monolithic force now discharges several functions: maintaining law and order, riot control, crime investigation, protection of State assets, VIP protection, traffic control, ceremonial and guard duties, service of summons and production of witnesses in courts, anti-terrorist and anti-extremist operations, intelligence gathering, bandobast30 during elections, crowd control and several other miscellaneous duties. Often,even fire protection and rescue and relief are treated as police functions. Accountability is greatly diluted when duties cannot be clearly and unambiguously stated and performance cannot be measured and monitored. The skills and resources required for each function are unique and a combination of often unrelated functions undermines both morale and professional competence. virtue of the need to control one function. Emphasis on brawn rather than brain in most situations tend to brutalise and dehumanise policemen. Lateral entry to the police is not feasible, as rigorous training, experience, expertise and knowledge of peers and colleagues are vital to the police service. Since this is a sovereign function, no agency or experience outside government prepares outsiders for police work. At the same time, incentives for performance within the police agencies are feeble. The indigenous system of policing in India was carried out through the village headman or Zamindar in early days. British relieved the zamindars of their liability for police service and their place was taken over by the Magistrates in the district. At the national level, the Gore Committee on Police Training (1971-73) was set up to review the training of the police from the constabulary level to IPS officers. Crime Investigation should be separated from other policing functions.A Crime Investigation Agency should be constituted in each state. Accountability of Law and Order Machinery – A State Police Performance and Accountability Commission should be constituted. 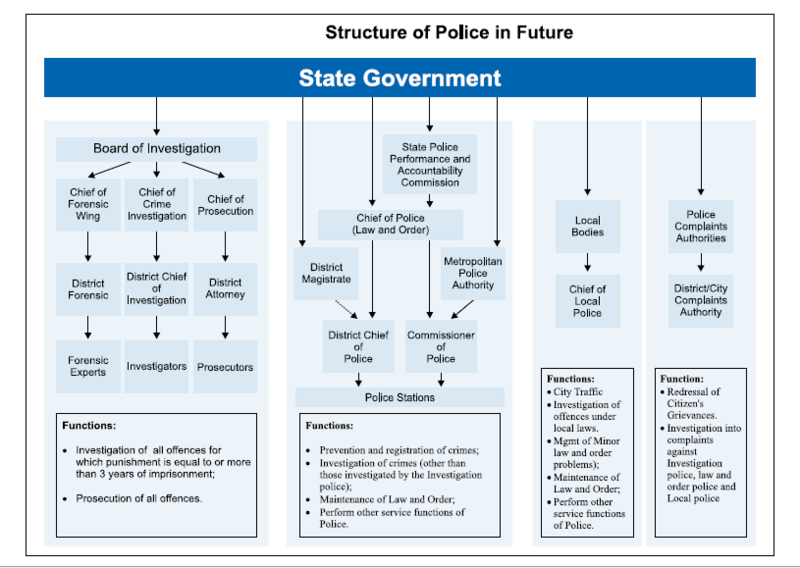 Police Establishment Committees – A State Police Establishment Committee should be constituted. It should be headed by the Chief Secretary . The Director General of Police should be the Member Secretary and the State Home Secretary and a nominee of the State Police and Accountability Commission should be the Members. This Committee should deal with cases relating to officers of the rank of Inspector General of Police and above.. Competent Prosecution and Guidance to Investigation:-A system of District Attorney should be instituted. An officer of the rank of District Judge should be appointed as the District Attorney. Reducing Burden of Police – Outsourcing Non Core Functions:- Outsourcing of non core functions like – Traffic management,patrolling streets ,surveillance domestic violence response disposal of dead bodies forensic service etc. conditions, better education facilities for their children, social security measures during service, as well as post retirement should be taken up on priority. gathering and processing. Sufficient powers should be delegated to them to obtain such expertise. Gender Issues in Policing:-The representation of women in police at all levels should be increased through affirmative action so that they constitute about 33% of the police. 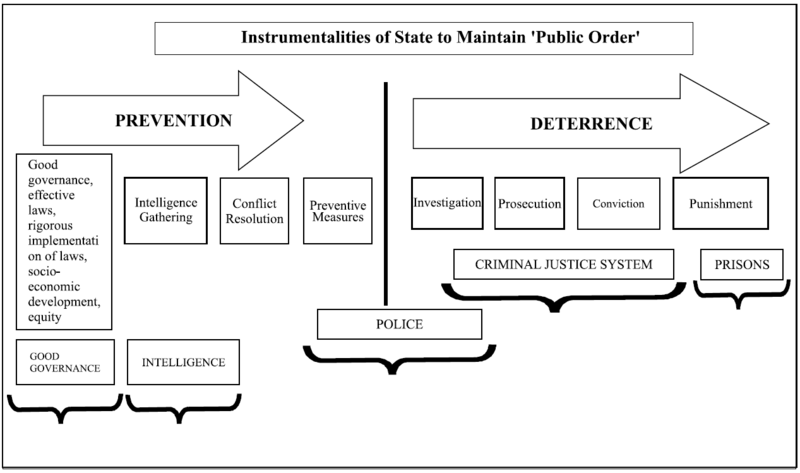 Security Proceedings:-The use of preventive measures in a planned and effective manner needs to be emphasized. Training and operational manuals for both Executive Magistrates and police need to be revised on these lines. Confessions before Police:-Confessions made before the police should be admissible. All such statements should be video-recorded and the tapes produced before the court. Necessary amendments should be made in the Indian Evidence Act. AFSPA:- The Armed Forces (Special Powers) Act, 1958 should be repealed . To provide for an enabling legislation for deployment of Armed Forces of the Union in the North-Eastern states of the country, the Unlawful Activities (Prevention) Act, 1967 should be amended accordingly. The concept of police as a ‘Service’ instead of a ‘Force’ encompasses the ideas of effective accountability, citizen centricity and respect for human rights and the dignity of the individual, These values should permeate all aspects of policing. Importance of Maintaining Public Order India today is poised to emerge as a global economic power with all its high growth rate of economy and all-round economic development. For realising our legitimate aspirations of economic development, it is essential that the problems of peace and order are managed efficiently in the country. No developmental activity is possible in an environment of insecurity and disorder. Failure to manage the multifarious problems arising out of violent conflicts based on religious, caste, ethnic, regional or any other disputes, can lead to unstable and chaotic conditions. Such conditions not only militate against realisation of our economic dream, but also would jeopardise our survival as a vibrant democracy. We have to look at the problem of public order management and the role of law enforcement in that regard, in this perspective. We should not forget that it is the weaker sections which suffer the most in any public disorder. There is also a need for greater transparency in the law enforcement agencies.